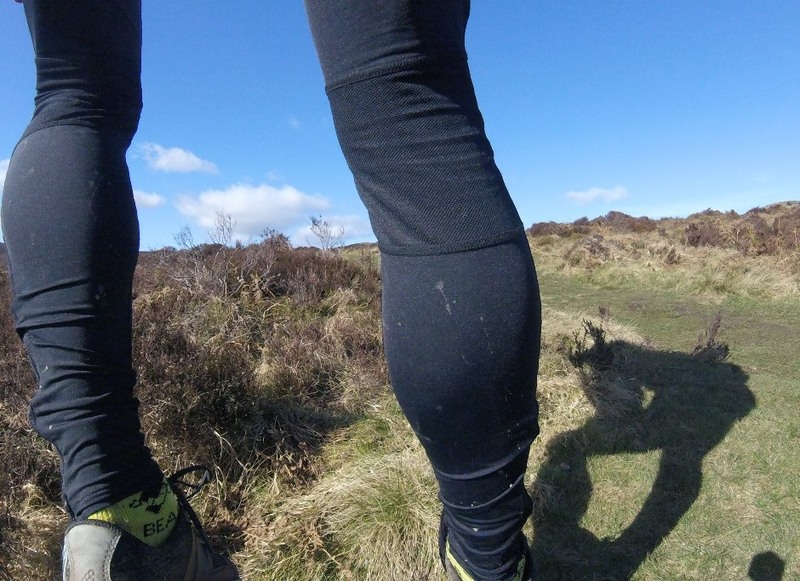 I tested the small men’s tights which weighed 169g on my scales. They Polyamide / Elastane material is soft and stretchy and gave a tight, almost compression like fit. Fit around my 28 inch waist was fine (I often find a small men’s size to be too baggy but not these) so I didn’t need to tie the internal waist band to get them to stay up. Length wise I’d say they were slightly too long for me with a bit of spare material at the ankle (but that’s more to do with my tiny legs than anything else!) 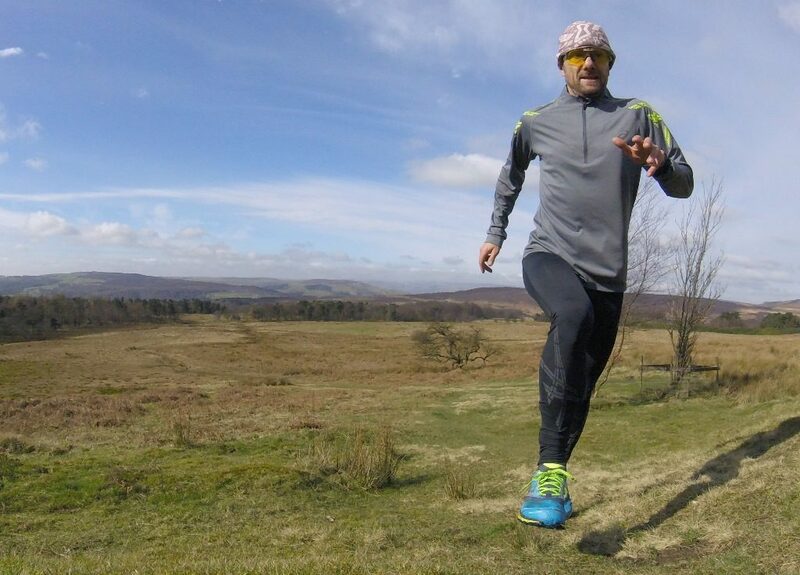 The athletic fit makes them ideal for both training and racing and I found that the material shed moisture rather than soaking it up. A small zipped pocket on the back right is just big enough to take a car key or gel and a mesh panel behind each knee allows a bit of ventilation. This is useful for faster paced running but you do notice a chill if the wind is particularly cold. does my zip look big? just enough room for a gel! 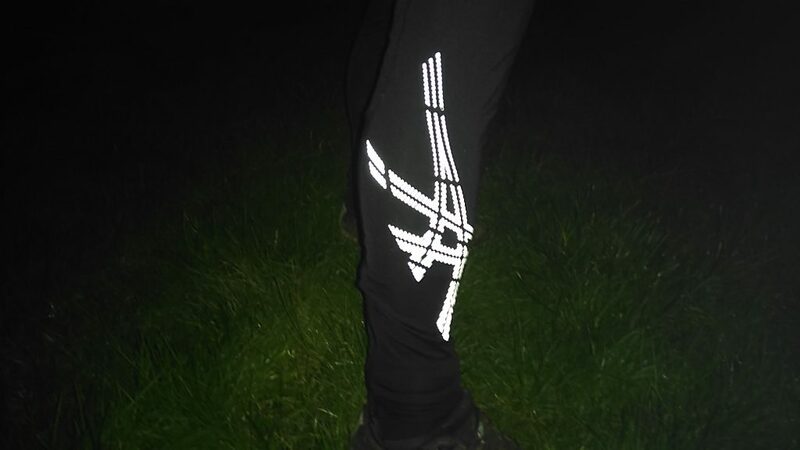 Reflective logos on the bottom of each leg are a useful feature for night time road running allowing you to be easily illuminated by car headlights and a short ankle zip makes it easy to put the tights on and off. 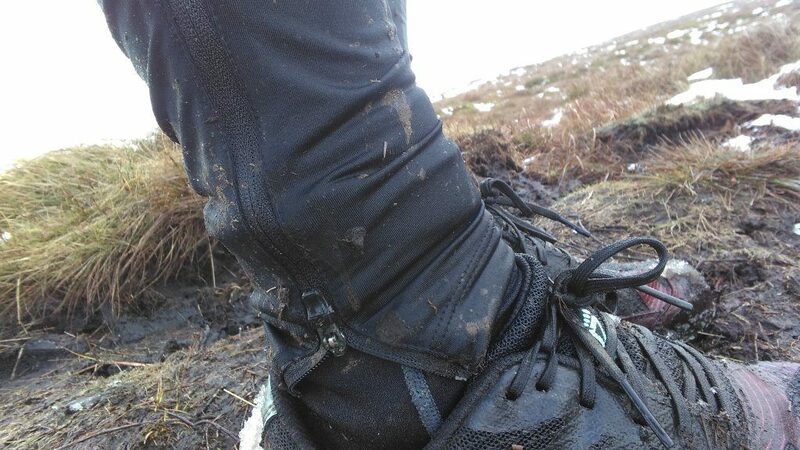 The zip is particularly useful if you’ve been for a run in muddy conditions as you’re less likely to flick mud everywhere as you take them off. The zip also locks to prevent it opening whilst running. 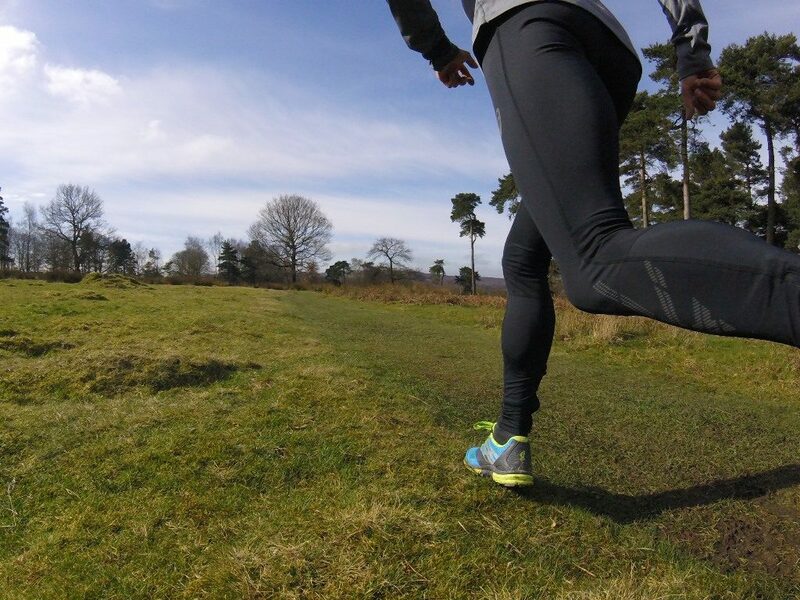 A comfortable pair of tights with an athletic fit, ideal for running in cooler temperatures. 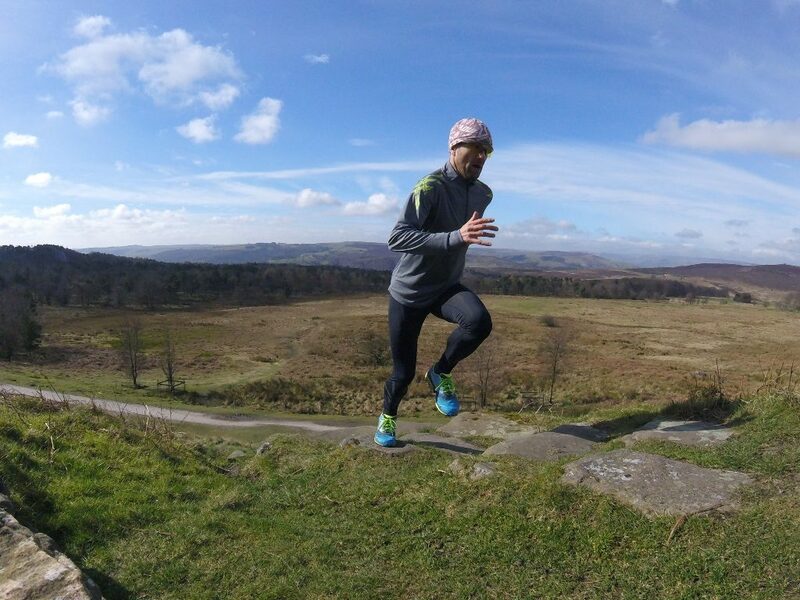 I’d use them for winter races and for training in cool conditions and also for mountain running in bad weather. Again I tested a men’s small which weighed 156g with the 100% Polyester top having a soft, slightly stretchy feel to it. The size small gave a fairly loose rather than athletic fit although the slight stretch would still allow a good fit for a larger – small runner. The high neck keeps the chill off your chest in cold conditions but then the deep zip allows good venting if the going gets hot and you need to cool down. A zip guard keeps the zip from rubbing when it is fully done up; a nice touch. 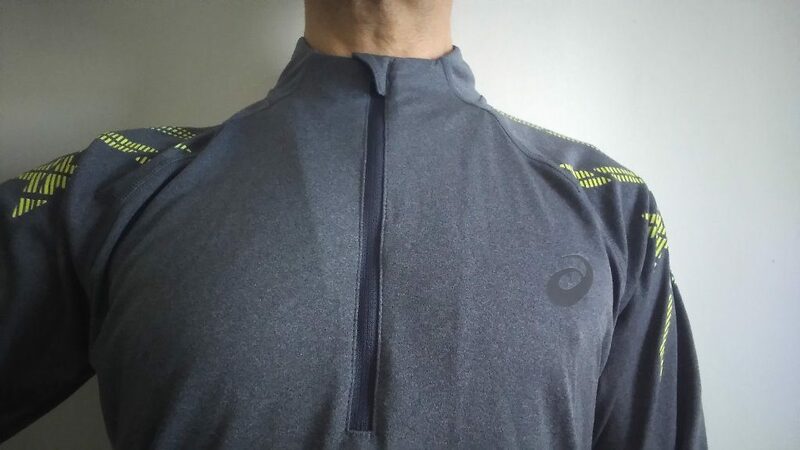 A reflective logo and pattern on the shoulders means that you can easily be picked out by car headlights if running on roads at night. The sleeves were easily long enough to cover the wrists and not too tight at the cuff which means that you could roll them up if you got too hot. The “Motion Dry” material is breathable and so wicks away moisture from the skin. I quite like the understated light grey with a hint of colour in the reflective yellow Asics logo – a nice match with my shoe laces! An affordable, comfortable, long sleeved top with a useful long zip. I’d wear it for chilly conditions that are too cold for a tee shirt or under a windproof or waterproof in colder, wetter conditions.